A Codman Square pop-up coffee shop is finding a new longterm home in Ashmont. Ripple Cafe, which for the past year has operated out of a Jamaican dining room, will fill the open cafe space inside Eastern Bank’s location in the Carruth Building. The spot was formerly occupied by the Flat Black Coffee Company space, which has relocated to Lower Mills. In a GoFundMe campaign page published today, owners James Guerrier and Gaelle Ducheine announced that they have signed a three-year lease with the bank for the 1906 Dorchester Ave. location. If everything goes as planned, they say, Ripple will open in October. The two self-financed until the pop-up was sustainable, eyes on expansion. 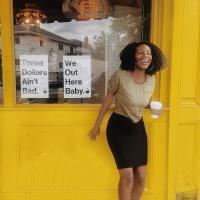 “We are proud of our initial success as young entrepreneurs, owners of one of a very small handful of black-owned independent coffee shops in the city of Boston,” they wrote. So with a year of operation under their belts, Guerrier and Duchesne are moving on down to Ashmont. The location is ideal, they note, with easy access to the Ashmont MBTA station and right in the middle of an active Main Streets district. While they work wth the Greater Ashmont Main Street group and the ReStore program on logos and signage, renovations will start immediately. The shop is expected to open on Oct. 1. Their GoFundMe highlights a few vision items and commitment in the new shop. Brewing with Counter Culture Coffee allows them to offer fair trade, sustainably sourced, high quality coffee, and local partnerships with Sweet Teez Bakery and CERO will help with their other services and products. Their workers will receive a living wage, as well as training and growth opportunities, they said. On the community side, Ripple plans to allow flexible hours for “third space needs” and donating a portion of profits to some local civic and non-profit organizations. “Having the opportunity to move into such a well-suited, permanent retail location after just a year of operation is a blessing and truly exciting,” Guerrier and Duchesne wrote. “We look forward to a bright and deeply connected future for our business in Dorchester.